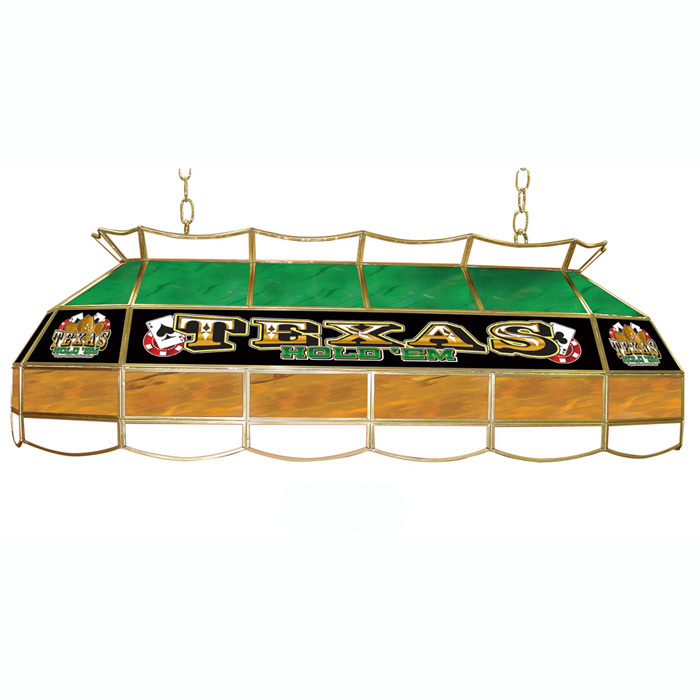 This Texas Hold 'em 40 inch Stained Glass Tiffany Lamp is the perfect gift for the Poker Fan in your life. Use for your lighting your Poker Table, Kitchen Table or even your Dining Room Table. Features include: handmade with stained glass brass or zinc channel, pull chain on/off switch,10 foot power cord (110 volt) with 3 prong plug, hanging hardware included, 3 feet of hanging chain included. Three bulb style (bulbs not included, max 60 watt per bulb). Great for gifts and recreation decor. This product has a freight charge of $159.00 due to its size.